A NorthTec applied writing graduate has won a place on a prestigious writers’ programme for Māori authors. 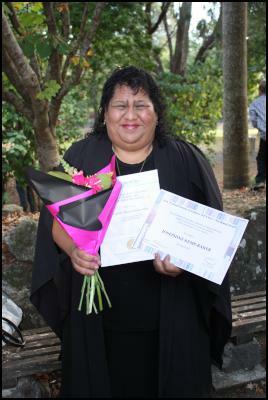 Josephine (Jo) Kemp-Baker, from Moerewa, was one of just six winners in New Zealand to secure a place on the Te Papa Tupu Writers’ Programme for 2014. Organised by the Māori Literature Trust and Huia Publishers, Te Papa Tupu offers talented Māori writers the opportunity to participate in a six-month intensive writing “incubator” programme, with the possibility of having their work published. Each participant is also matched with a mentor, to provide advice and guidance, and Jo was delighted to find herself paired up with established Northland writer, Margaret Cahill. Jo, who is of Ngāpuhi and Ngāti Kahu descent, said she was very excited about the programme, with the best part being that participants get paid to stay home and finish their manuscripts. She is a previous winner of the New Zealand Society of Authors’ Northland branch award, after being judged the top writing student of 2012. Jo credited her success to her tutors at NorthTec, who gave her the courage to apply to the programme, and her family, who have supported her and provided inspiration. Find more from North Tec on InfoPages.